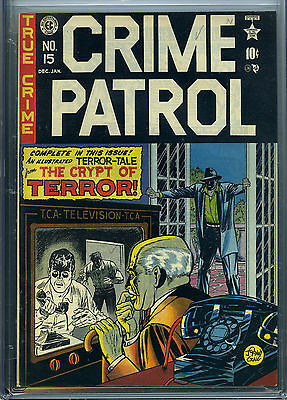 CRIME PATROL #15 - CGC - EC - 1st Crypt Keeper & Crypt of Terror - High grade! This very beautiful, unrestored copy has cream to off white pages. First appearance the Crypt Keeper and the Crypt of Terror. Used in the NY Legaislative Committee. Johnny Craig cover and stories by Al Feldstein and Johnny Craig. Condition is a very conservatively graded CGC - 9.2, NM-. From the collection of Ron Pussell, longtime senior Overstreet Price Guide consultant. Shipping & insurance: US Shipping - Fedex available upon request. Combine our auctions and $ave on shipping! Nevada residents, please add sales tax. We accept PayPal, MasterCard, Visa, Discover, American Express.